After all our cleaning and culling and decluttering over the past little while, I was taking some things that we don’t need anymore to donate to the local women’s shelter. H and I had already done some running around earlier in the day, and we had also been out picking blackberries… so I left him at home as he was clearly at capacity. The round trip was about 15 minutes, and when I arrived home I could hear H talking to someone through his open bedroom window on my way up the front stairs. Of course, I immediately asked who he was talking to, and he briefly excused himself and explained that he was on the phone with Apple Support. He was problem-solving and apparently getting some bugs worked out with his iTunes account or something on his computer. I was surprised. I wanted to jump in. But I resisted – and just listened instead – from the other room. And wow, I am glad I did! I love that H was able to get the help he needed and just took the initiative to deal with it himself. It sounded like it was going well and that he was just winding up his call. Though, apparently, he was not quite done. He was still asking clarifying questions, checking his understanding, and getting the information he needed. I assisted H with recording and organizing some new password information he needed to log for future use. But I have been looking deeper recently. I am unpacking independence and the ableism inherent in what I had unquestioningly accepted as a rather narrow definition: independence = not needing help. I have been thinking long and hard about independence and the layered, inferred and multiple meanings behind it. In my best vision of the world, it would be acknowledged that we are all dependent upon each other: interdependent. We all have strengths and weaknesses – and when we are given opportunity for our strengths to flourish – and support so that our weaknesses are lessened – we can be our best selves. I have more unwinding to do around the concept of independence, and how there seems to exist a double standard around its meaning. And I am noticing a problem inherent in our tendency, as a society, to judge and use this word to marginalize and stigmatize. It seems there exists an unspoken hierarchy of independence and that certain dependencies carry less stigma – or none at all – whereas some dependencies are weighted in a way that devalues an individual. There are more perspectives to consider, more voices to listen to, and more pondering to be done, to redefine or reframe independence to be more useful and more honouring for diverse ways of processing or interacting with the world. Image Description: Photo of two apples (one real, the other made of blown glass with an embedded flower pattern) on an apple patterned table cloth. 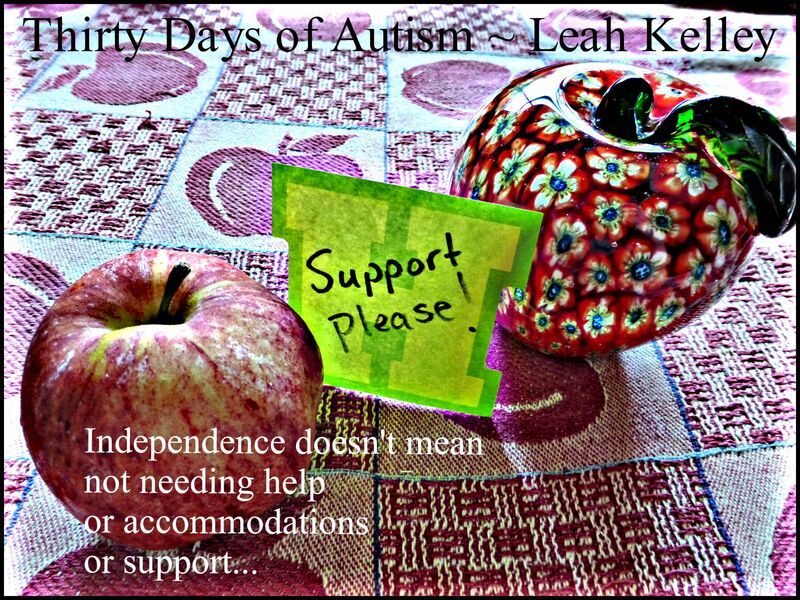 There is an H shaped note paper balanced between them upon which is written “Support Please!” Text reads: “Independence doesn’t mean not needing help of accommodations or support…” Thirty Days of Autism: Leah Kelley. What is Independence Anyway? 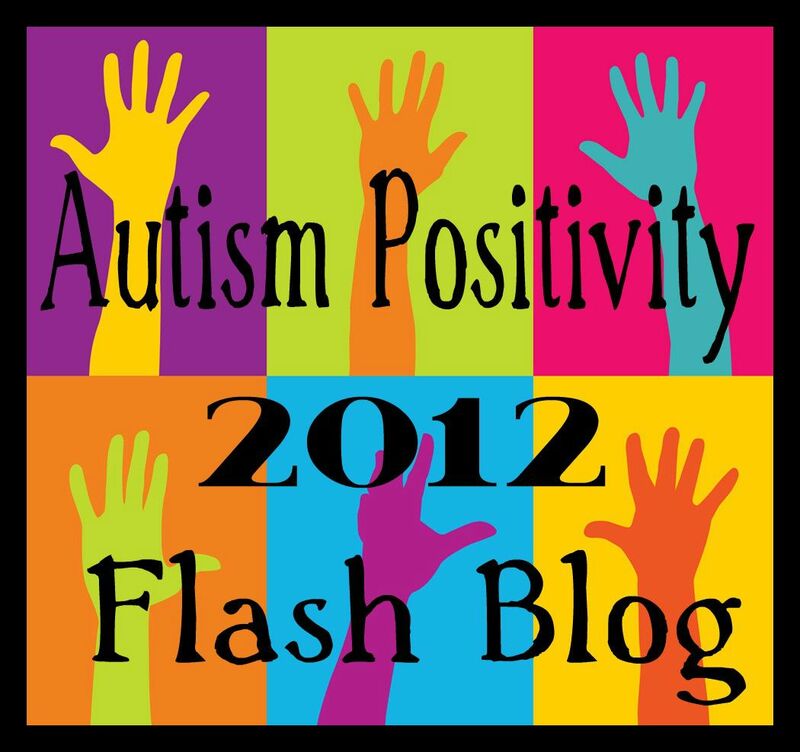 by Amy Sequenzia (On the blog “We Are Like Your Child) and if you are interested in reading more from Amy, her blog is listed in the blogroll (over on the right) Non-speaking Autistic Speaking ♥ which contains links to her contributions on multiple sites and projects. This entry was posted in ableism, Autism, IEP, support and tagged ableism, Apple Support, asking for help, help, independence, interdependent, problem-solver, redefining independence, self-determination, support. Bookmark the permalink. I relate to this one so much. It is the paradox of where we are with our son. We asked the school to build a cocoon around him where he could feel safe and supported and able to grow. They did. And now we find ourselves asking them to teach him how to come out of that cocoon. Hard stuff this. What a fantastic article. I especially appreciate your perspective first as a classroom teacher, and then as a parent of a child on the spectrum. Interdependence: a beautiful word. In the end, we are really quite similar on the human spectrum, despite some significant differences. Thank you so much, Steve. I always appreciate your kind and supportive words. When I was going through adolescent difficulties while at university, the idea of interdependent independence became crucial. I think the idea must have been part of student culture at the time. Now I’m much older, the idea still very much applies to how the family of which I am part, works. 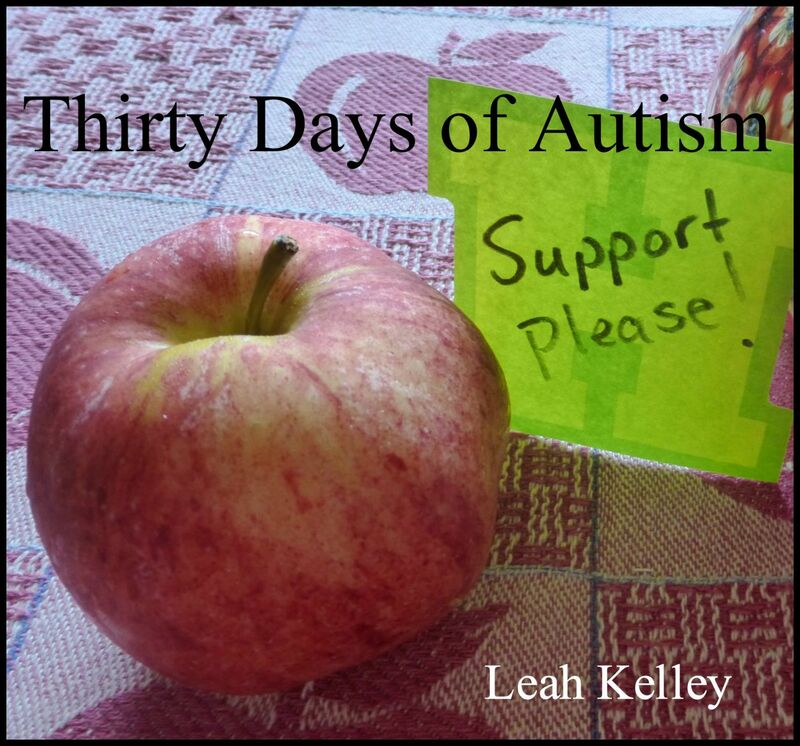 In my thinking about the autistic, I see it as necessary for there to be a tailored community of relevant support around each autistically developing child. Maybe the word independence can connote something other than we imagine. An archaic connotation is that independence means “a competency”. While a current connotation is that something is done or sustained without intervention from an outside agency. I can’t think of any current thinking of note that would have it that anything occurs without being embedded in an environmental context without which that outcome could not take place. The idea of a wholly independent event is an abstraction without empirical actuality. Regards autistic events, the living moments of an autistically developing person’s occurring, I think that the interdependent independence aspect of things, is akin to the nuclear-fusion technical conundrum. Where the fusion event is metaphor for the truly autistic moment, and the enabling containment of that event is metaphor for the supporting of the autistic that we needs win through to. The technical conundrum is in the containing, as fusion-reaction absolutely annihilates what containment we can muster; just as the truly autistic absolutely annihilates any social inescapably involved in support of it. Such that to sustain support of what is autistic, we are constantly drawn into transcending our socialised self, and instead being inspired by the autistic we encounter. It’s then very difficult to sustain the autistic in a balanced manner. Deconstruction of the social (akin to nuclear fission) is an accessible possibility, but sustaining the autistic beyond the trammelling effect of the social (akin to nuclear fission) is almost not accessible. The competence in the autistic is that it can bring insight from beyond the hermetic encapsulating the collective of which they are member. The exigency in the autistic is that everything involved in exercising that competency brings the autistically developing person into tension and conflict with their collective of membership. The metabolism in the autistic is to constantly return to an impulse to methodically transcend the limits attaching to that membership. What is then involved in so transcending is so complex, that transcending attempts invariably breakdown, only to be later taken up again. Independence in the autistic takes the autistically developing person into challenges so great, that failure goes with the autistic landscape. Support across interdependence is then called for. Something like the Heisenberg uncertainty principle then applies. Eventually, if autistic challenge of a conventional hemetic is repeated sufficiently, its transcendence becomes a possibility; and then the autistic competence of being able to take a collective beyond previous limits, is realised. Thank you Leah, for being the containing-supporting context enabling me to imagine and articulate what I have written. Just as you do for Hugh. Thank you to you as well, Colin. The opportunity to interact with you around ideas such as this are a huge part of what makes me better able to understand my child, and others, who experience(es) the world differently. It seems that the entire idea of independence needs to be reconsidered. I sense that what typically happens is that when we see independence in an individual, instead of viewing it as a competency, as you suggest is the true origin of the word, it is often interpreted as an area ‘no longer needing support.’ When this happens it too often follows that the individual is then catapulted into a domain where they do not have to supports needed for continued competency or success. I think that can almost be the breeding ground for a fear or anxiety around success. I know I have felt this at times during my life… that sometimes success can be as frightening as failure… because it sets up the expectation of continued success. It seems to so often be the case that maybe we do see independence as competency – but then twist it to take on the meaning of not needing further support. When this is combined with the expectation of further success – it can be a set-up for a shame response for both the individual and others. I think that is damaging. When we see a competency – and then have a tendency to see it as an individual trait in an isolated situation that should be easily and effortlessly reproduced and generalized to other contexts – rather than viewing it within the context of the support system and the supported skills of an interdependent series of relationships – then we are setting the scene for an unsustainable competency. I am not sure I am explaining this well – but it seems that pulling a competency and calling it an independent skill – and defining that as something that exists in isolation – is damaging to the individual and sets up a cycle of tearing down development. I think you are also suggesting that when we add the constructs of the social – to the autistic experience – there is potentially a further breakdown of the cycle of development. The social constructs can deny the organic process of the timelines of the naturally occurring autistic development I see in my child. There is a way to support the individual within a system that supports the self-determining organic-like development that I see within H. I think it comes with lots of time and space and honouring of the individual’s process. We do course do not have all of the answers – but we are working hard to support our child with the space to be himself and time to explore his natural interests. There is a pressure to say, ‘Ah – he is good with programming, or editing film, or understanding computers, or creating ?? ?’ and then find programs or programming to fill his time with more formalized and technical training in these areas. I rail against that. It is like the formalized training will steal away his authentic approach to an area of skill and interest, and the beauty of his organic and self-directed exploration of an interest might be lost. I do not want our non-autistic approach to taint these areas of passion that fuel him and give him such a meaningful sense of identity. In this context – where my child’s skills are far outflanking mine – my role is to protect his time and space and support him with opportunity and encouragement. When he seeks it – we will offer him opportunities to further his skills – but we are cautious that the timeline for this should belong to him. If I am understanding this – it seems that we need to support and embrace competency within an ongoing context of interdependence, in a way that doesn’t withdraw the scaffolding like some sort of checklist of support. It is also critical to be wary of the tendency to necessitate further actualization of development in a preplanned way: “You did this – so now you must to this… this is the next expected step!” The needs for all of us – every one of us – are better served if we are to be in an ongoing support network of interdependence.